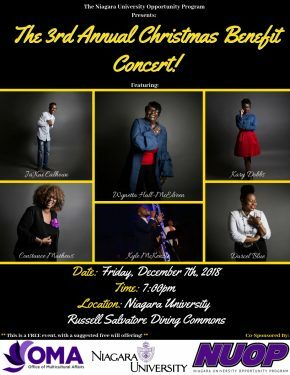 The Niagara University Opportunity Program (NUOP/HEOP) is honored to host its third annual Christmas benefit concert on Friday, Dec. 7, 2018, at 7 p.m. at the Niagara University Russell Salvatore Dining Commons. The concert is free and open to all, but free-will offerings are encouraged and gratefully accepted. These proceeds typically go to support local charities, but this year, we want to help one of our own–freshman Tyla McKenzie, who just lost her younger brother to cancer. We will be donating the proceeds from this year’s concert to Tyla’s family to help them get through this difficult time. Please help by attending and giving what you can. The NUOP is a comprehensive program designed for students who have the potential for and interest in furthering their education but are not admissible under Niagara University’s regular admissions criteria. The ultimate goal of the program is to make higher education possible for students who are both academically underprepared and economically disadvantaged. As we continue to grow as a program, we are fully committed to providing programming and opportunities for our students that help them mature and grow academically, socially, emotionally, and spiritually.